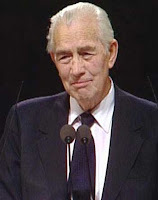 Elder Mark E. Petersen (1900-1984) served as a member of the Quorum of Twelve from 1944 until his death in 1984. "Let us ask ourselves how important the Lord’s atonement is to us. How dear to us is the Lord Jesus Christ? How deeply are we concerned about immortality? Is the resurrection of vital interest to us? "We can readily see that observance of the Sabbath is an indication of the depth of our conversion. 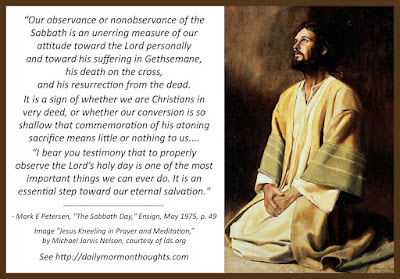 "Our observance or nonobservance of the Sabbath is an unerring measure of our attitude toward the Lord personally and toward his suffering in Gethsemane, his death on the cross, and his resurrection from the dead. It is a sign of whether we are Christians in very deed, or whether our conversion is so shallow that commemoration of his atoning sacrifice means little or nothing to us. "Do we realize that most national holidays are observed more widely than is the Sabbath, so far as its divine purpose is concerned? "Then have we put God in second or third place? And is that what we want to do? Is that where he belongs? "I bear you testimony that to properly observe the Lord’s holy day is one of the most important things we can ever do. It is an essential step toward our eternal salvation." Elder Petersen was one of the senior leaders of the Church when I was young, and I looked up to him in many ways. This talk on the Sabbath Day is truly a classic, and is worth referring to particularly as the concept is being re-emphasized in our day. Elder Petersen's comparison between the way the Sabbath is honored, and the effort sometimes put into commemorating other national holidays, tells a lot about the general attitude in out day towards sacred things. In large measure, people of our time have forgotten what it means to have a holy day. We must not let that happen in our individual lives!